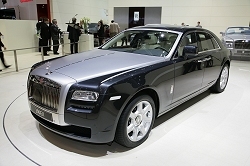 The Geneva Show is in rude health, despite the economic situation. Here's the run down. It's all over bar the shouting and if you happen to meet any of the Car Enthusiast team and ask us what was the star of the show you could be met with a bewildered look of fear, as the Geneva Show halls were crammed full of new metal, ranging from really impressive frugal new showroom models (such as the VW Polo BlueMotion) to fanciful electric supercars (take a bow Koenigsegg), several hypercars (thank you Lamborghini, Bugatti, Ferrari, Pagani, Bentley, etc) and handfuls of concepts, some of which are thinly disguised production cars, others simply for our delectation. Below you'll find a stand-by-stand rundown, with individual articles and our extensive picture gallery from the show linked to from the left-hand side. It'll be updated constantly during the course of the week. Undisputed star of the Alfa stand was the MiTo GTA concept. For some reason, the pre-show press pictures made Alfa's new hot hatch look more outlandish than it really is. Sure, it's wild, but it also looks realistic, so you can ignore the 'concept' tag. Alpina, the factory-approved BMW tuners, brought its lurid green M6-based B6 GT3 racer to Geneva, alongside its first version of the new 7 Series, the new Alpina B7. 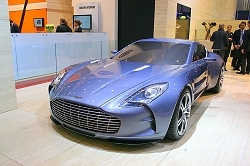 The small British company punched way about its weight in Geneva, giving the V12 Vantage, DBS Volante and the outrageous One-77 their world debuts. Not to mention the resurrection of the Lagonda brand with an aggressive new concept car based on a Mercedes SUV platform. 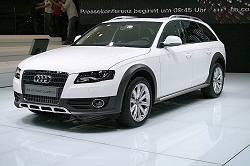 Two new cars from Audi in Geneva: the A4 allroad quattro and the rip-snorting TT RS. The latter should once and for all banish the TT's reputation as a car more about style than driving excitement. 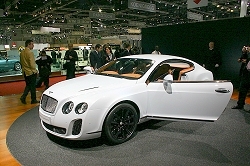 Bentley revealed full details of the Continental Supersports ahead of the show. The new bio-fuel powered supercar is obviously based on the Continental GT coupé and Bentley claims that it will be the most powerful and fastest Bentley yet. Peak power is 621bhp from a bio-ethanol fuelled twin-turbo W12. Surprisingly, the only big news on BMW's stand in Geneva was the public debut of the Concept 5 Series Gran Turismo, heralding a new BMW-invented niche in the car market. It'll hit production too, as will the X6 and 7 Series ActiveHybrid models - later this year in fact. Chevrolet's new global mini-car, the Spark, made its world debut in Geneva, though the company took the unusual step of revealing an image of the car in January at the Detroit Show. The entire four-door Cruze range was also on hand. Most of Citroen's stand seemed to be dedicated to the new C3 Picasso, despite the reinvention of the company spearheaded by the new DS range of models. In Geneva, the DS Inside concept made its first public outing, previewing the 'DS3', a premium hatchback due in a Citroen showroom near you soon-ish. EDAG isn't a name we often discuss, but the car component manufacturer has a few ideas up its sleeves and the unusually titled Light Car - Open Source is a demonstration of the company's future technology. 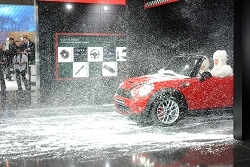 Star of the Fiat stand was the new open-topped version of the 500, to be named the 500C. It's not a traditional cabriolet, but instead has an electrically retracting canvas centre section. Honda's stand features the final run-out edition of the S2000 and a new 178bhp turbodiesel version of the Accord Type S. It'll also be the first European outing for Honda's Insight hybrid. 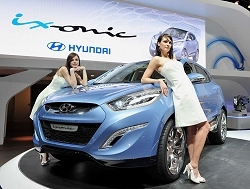 Hyundai launched a three-door version of the i20 in Geneva, along with the i30 blue, featuring stop-start technology. However, most show visitors will find the HED-6 concept (officially tagged the ix-onic) of more visual interest, and it hints at how the replacement for the Tucson SUV could look. The promising G37 Convertible received its first European outing in Geneva, though next to the drop-dead gorgeous Essence concept hybrid supercar it won't get a look in from most show goers. 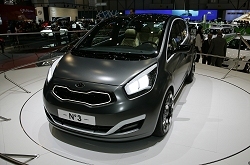 Kia's design revolution continued in Geneva with a new mini-MPV concept called the No. 3. 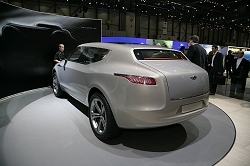 It closely resembles a near-future production model and Kia openly called its potential rivals 'bland'. The super-luxury arm of Mercedes-Benz reveals its even more luxurious Maybach Zeppelin in Geneva. Are people still buying these cars? Mazda unveiled the new 3 MPS and stop-start system (called i-stop) in Geneva. On top of that, a facelifted CX-7 made its world debut, fitted with a diesel engine for the first time. 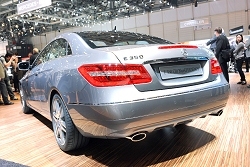 Officially the new Mercedes-Benz E-Class made its world debut in Geneva. We were among 'just' 650 guests in Detroit that got a sneak preview of Merc's new executive saloon, but this is the first public outing for the car. Visually of more interest is the tasty new E-Class Coupé. MINI is holding back its new Crossman crossover thingy until the Frankfurt Show, though it did have the launch of a Clubman version of the MINI One and the John Cooper Works Convertible in Geneva to keep us on our toes. The only new metal of interest in Geneva from the Japanese company is the i MiEV Sport Air concept - a fun electric two-seat coupé concept with a roof that opens. An updated version of the regular i MiEV was also on display in prototype format, previewing a new EU model. Nissan's stand is full of new metal this year. World debuts include the interesting Qazana compact crossover concept and a seven-seat version of the company's new NV200 commercial vehicle. Geneva is also European buyers' first chance to see the new 370Z and Cube in the metal. Peugeot's only new car on show in Geneva was the 3008 'crossover'. It's a neat design and will spawn a four-wheel drive hybrid version in time. Lots will come from the Porsche stable this year, including the new Panamera, though that was not at the Geneva Show. The awesome new 911 GT3 was though, alongside the showroom-ready Cayenne Diesel. 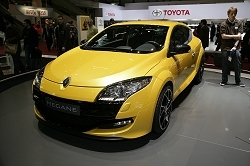 Renault boasted more new models in Geneva than anyone else. Along with a facelifted Clio line-up, new Mégane Sport Tourer (estate) and updated Scenic and Grand Scenic, the new Mégane Renaultsport 250 and Clio Renaultsport 200 made their world debuts. 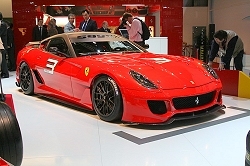 As ever, madcap Swiss tuners, Rinspeed, took the wraps off a bizarre concept at the Geneva Show. 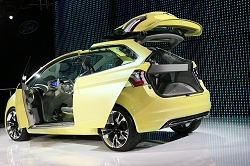 The iChange alters its shape to be a coupé or a people carrier, depending on your needs. Rinspeed also displayed the E2, a modified Abarth 500. Despite the doom and gloom surrounding parent company GM, Saab is forging ahead with a jacked up 'soft-road' version of the 9-3. The 9-3X made its world debut in Geneva. Taking centre stage in Geneva on the SEAT stand was the new estate version of the SEAT Exeo, called the ST. Alongside are facelifted Leon and Altea ranges, plus an unexpected star in the form of the new Leon Ecomotive: how does 99g/km and 74.3mpg sound to you? 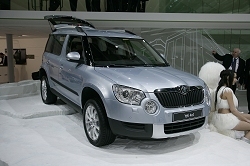 The new Fabia Scout was on Skoda's stand, though it was all but invisible next to the new Yeti crossover. Skoda's first SUV has evolved neatly from concept to production and it's just the kind of thing buyers want right now. The new Toyota Prius received its first public outing in Geneva, while the new European-built Verso MPV made its world debut. An Opel-badged and restyled version of the Chevrolet Volt electric car debuted in Geneva, previewing a new Vauxhall electric car about the same size as the Astra. It could be the most significant car of the show, though the viability of GM's European operations were under more discussion than this exciting new car. 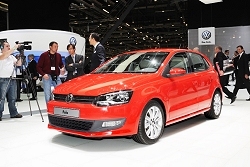 One of the outright show stars was VW's all-new Polo. The regular car is a neat new design that apes the new Golf from the front, but the limelight was positively stolen by the new BlueMotion 2 version, which will boast 85mpg and 87g/km of CO2 when it arrives next year.